So, things will mostly be settled by tomorrow morning. Just got back from the men's basketball game....post on that coming later. For now, a couple updates at least on recruiting. The biggest news is that Noah Harvey is going to MSU. You had to worry when he took the visit up there. He would have been very good for us, but this is what happens when you recruit at that level. I always say...it is his life and he should go to college where he wants. Wish him nothing but the best. BG also now has a verbal from Derek Downs, a 6'7" 305 OT from Westerville North. According to this, BG was his only FBS offer, but he had a dozen other offers and until today he was a commit to Youngstown State, which has a pretty good coach and program. Usually I try to find more about guys, but frankly we will see all that tomorrow. There might be some other changes....there were hints of a lot of movement from John Wagner today. It will all be clear soon. Your best source of info is BGSU tomorrow, they will do a great job updating you as each signee's letter comes in. I have a widget set up here that you can use to watch their feed if you prefer. So heading into signing day, here is the depth chart for the Buffalo game with known departures removed, just to give us an idea what things look like heading into next year. BG has at least four JUCO players at last count who can step in right away (or at least 3 of them). BG has an additional o-line verbal coming in. It is Samuel Neverov from Dublin Jerome HS. He's 6'5" and 288 pounds. He played inside (G.C) in HS but you can never tell, guys seem to be able to move around a little bit. He was named first-team all-district. There's not a lot of information out there, but maybe we will get more on Wednesday. In the meantime, welcome to the Falcons, Samuel. And this has the potential to be a big one. And in this case, that pretty much can be taken two ways. His name is Matthew Tanner and he's a 6'7" and 345 lb offensive guard. Here's what's interesting. He had an offer to Auburn. And visited last weekend. The offer from Auburn was said to be meaningful on the blog, and he certainly seemed excited. In fact, he said he was 99 percent going to Auburn. So, something happened to turn that around. We may hear more about what it was. For now, honestly, who cares? And he also had reported offers from Mississippi State along with UAB, Georgia State, and Louisiana-Monroe. 24/7 has him listed as a 3-star recruit and as the #4 JUCO G available. He's from Jacksonville originally but was playing at Eastern Arizona College. He was first-term All-Western State Football League and second-team All-Arizona Community College Athletic Conference. So, however you slice it, this would appear to be a guy who can step right in on day one and play on a line that has lost players to graduation. He played for a triple option team at Eastern Arizona, so run blocking is a strength and that's our new identity and all. Anyway, Tanner has the potential to be one that we are really happy about. Welcome to the Falcons Matthew. The recruiting wars are continuing and BG scored a hit on Monday with Jerry Roberts, who played for Cathedral Prep in Erie, PA. He is a 6'1", 225 LB. You know how this blog feels about Pennsylvania players. Their team was the state champions this year. Roberts was all-state in PA twice and had 90 tackles in his senior season, including 12 in the state title game. According to the story linked above, he had more than 10 offers. Scout includes 8, of which three are D1: Air Force, BG and Ball State. And with a service academy on the list, you know the academics are strong. One thing....you don't have to doubt whether Coach Jinks wants to play defense and offense. The Men's Basketball Season rolls out with January's last game. In this game, BG plays the only team in the MAC with a worse rating than they have. And it is at home. Failing to win to this one is going to hurt. I cannot believe that Miami still has John Cooper at the helm. He came in when Coles retired. This is his fifth season and he has yet to win more than 13 games in a season. 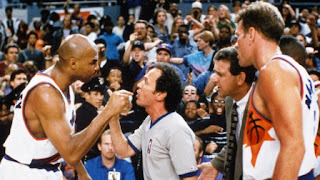 For those of us who are a little older, Miami has been a traditional power in basketball (and football for that matter) stretching back decades. This level of struggle has just been unheard of. Miami is 9-12 and 2-6. There are 2 non-D1 wins in there. Their best non-conference win was over #197 IUPUI and #70 UCF was the best team they played. They have yet to win on the road this year. In the MAC, they beat NIU in the opener, then lost to @Toledo, @BSU, Akron, @NIU and @CMU. Then they nipped Buffalo and on Saturday lost by 17 @EMU. Last year, BG and Miami split the series, both winning on home court. So here is what it looks like when the two worst teams in the conference play. Miami is 9th offensively and defensively and BG is 12th on offense and 9th on defense. Those kinds of spreads weirdly show an evenly matched game, since neither team has effectively produced anything on either end of the floor to date. When Cooper first came in he jacked the tempo up a bit--though from Coles there was only one direction to go--but now they are back to playing relatively slow and BG is playing the #4 tempo in the conference. 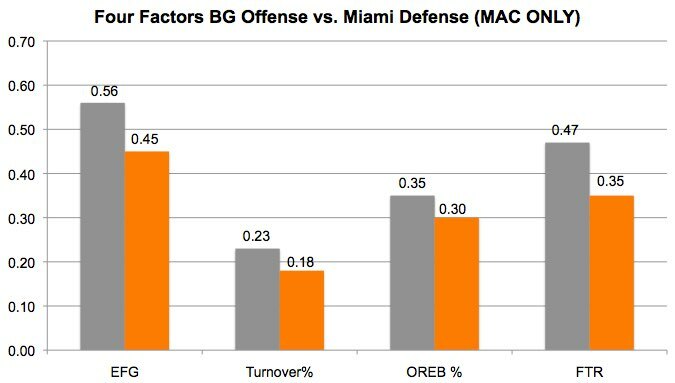 As mentioned, Miami is #9 in the MAC in offensive efficiency. They are #8 in shooting, #9 in turnovers and #9 in offensive rebounding. 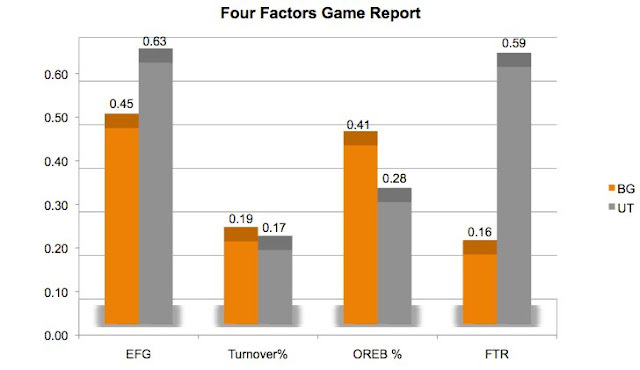 Their only area of offensive success is getting to the FT line, where they are #5, though they are #9 in making them. BG's biggest weakness on defense is defending the shot. They #10 in field goal defense. The Falcons are #5 in the other three areas. (This number is slightly impacted by OU's shooting Saturday in a non-typical situation). Miami does not shoot a lot of 3s. They are 9th in the MAC in 3FG attempts as a portion of overall shots and 8th at making them. They are 6th in making 2FGs. BG is 11th in the MAC in defending 2 FG attempts. So what happens when a team that struggles to shoot plays a team that is easy to shoot against. We shall see. 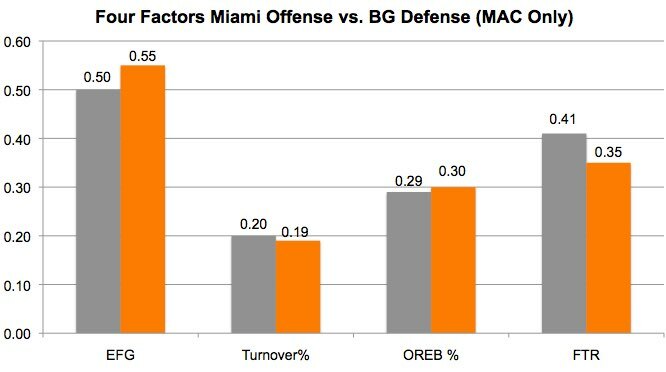 Looking the other way, Miami has only one strength on defense, which is forcing turnovers. They lead the MAC in it. They are 10th or 11th in all of the other 3 areas. There will be a premium on BG taking care of the ball, something BG has done fairly well this year. BG's shooting struggles are tough. BG is last in the MAC in effective FG% and #303 in the whole country (out of 351). They are last in the MAC in 3FG shooting and #11 in 2FG% and 9th in making FTs. So take care of the ball and then sink some shots. Miami is led by a young man who is almost for sure the top FR in the MAC. Michael Weathers is scoring 15.9 PPG and is 2nd with 6 assists per game. (MAC ONLY). He also shoots 45%. He is joined on the team by the MAC's second best FR, his twin, Marcus Weather. Michael is a 6'2" G and Marcus is a 6'5" F. Marcus scores 12.6 PPG on 61% shooting and 5.7 RPG. Their other double figure scorer is Logan McLane. He's a 6'9" JR who has never really contributed until this season. This has been a breakout year for him. He's scoring 14 PPG on 56% shooting and 8 rebounds a game. So, that's how they stack up. These teams view each other exactly the same--as a chance for a badly needed win. We'll see who gets it. News from the Sentinel on the not good front. We had noted that CJ Pickrom had been removed from the BGSU roster. I had seen some stuff on Twitter about why it might have been, but you never know what's going on with that. From the Sentinel now, CJ Pickrom is indefinitely suspended and charged with assault. You can find the details here. You never like to hear this kind of thing. It will happen and needs to be addressed, however, and I think Coach Jinks is showing himself to be a good steward of the program's reputation and dignity in this regard. (See quote in story). For those scoring at home, Pickrom was a Jinks recruit who committed between when Coach Jinks came on board and signing day. He is from Houston and did play in five games as a true FR. As expected, OU demolished BG 96-72, as the Falcons played with 6 scholarship players and 2 football players due to the suspension of four players. The players will be back for Miami on Tuesday. In the meantime, there's no point in dragging out the stats for this one, which was completely one-sided most of the way. Here, however, are a few observations. “That shows that if you do the right thing and you’re able to score when you’ve got guys who don’t know anything about your offense and what you’re running,” Huger said of the contributions of Folkertsma and Redding. So, that's pretty interesting. No need to belabor the point, but it is not the first time Coach has made an observation like this. Anyway, thanks to Hunter and Teo for pitching in. This was a one-game thing, so they're headed back to the weight room. Dylan Frye had a big game, scoring a career-high 24 points. He shot 9 of 17 and 3 of 10. He also added 6 rebounds. I continue to think that he's going to be a very good player for us. You just see "ballplayer" when you watch him. Now the rest of the starters? Yeah. Wiggins is slumping offensively. He shot 1 of 5 from the field and 5 of 12 from the line. He did add 12 rebounds. And he played 26 minutes, which means BG played 14 minutes without a true big man on the floor. Wes Alcegaire shot 2 of 14 and 0 for 4 with 5 rebonds and 3 assists. Rod Caldwell shot 3 of 12 and 1 of 7 and no assists. Matt Fox also shot 0-6. That's a struggle right now the line. Malik Hluckhoweckyj played 29 minutes, by far his longest stretch as a Falcon. (He was a Jans recruit who stayed with the program once Coach Huger stepped in.) He had 9 points and 9 rebounds, shooting 3 of 6 and 2 of 5. Coach said after the game that he would be comfortable playing Hluckhoweckyj in a game situation. It will be interesting to see if he gets more minutes. To date, he has had very few. So, that's over. BG has a pretty big week coming up. 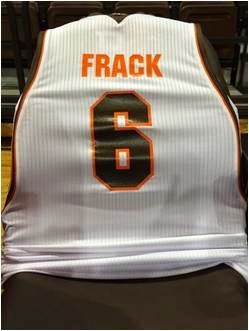 First, on Tuesday they play Miami at Stroh. The RedHawks are the only team in the MAC ranked lower than BG. The Falcons have a kenpom of 265 and Miami is 276, and both teams are 2-6 in MAC play and tied for last with WMU. In a season where wins are hard to come by, you just have to get this one. Then, next Saturday, UT comes to town. The big question is whether anything is going to change on the court. BG has played Ball State effectively twice. On the other hand, 4 of their 6 losses in the MAC have been in double digits and 3 of the 6 have been 17 or above. These are teams in our conference. You'd like to see the team come together and bring a strong effort out there Tuesday and Saturday. We shall see what actually happens. 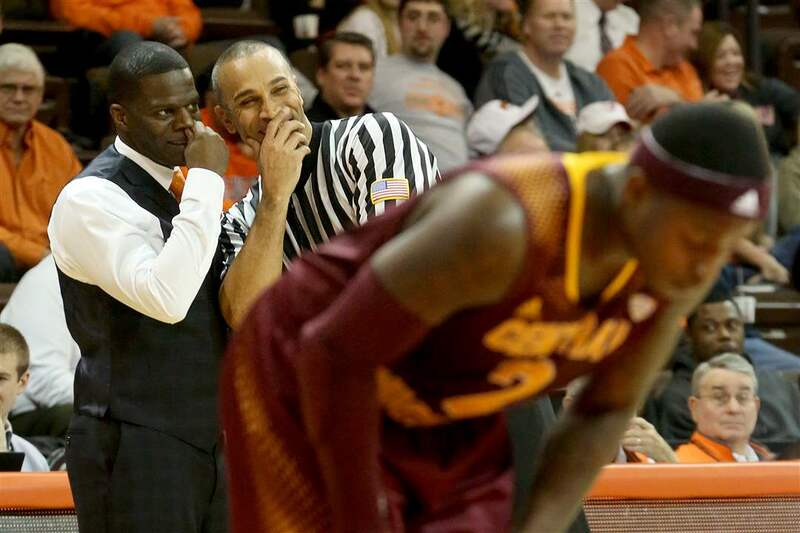 With injuries & suspensions the BGSU Men were desperately needing bodies. Both Redding & Folkertsma practiced today. Well, the four suspensions, plus the injuries to Turner and Uju, left the BG Men's Basketball program short on bodies. Really, you are down to Wiggins, Frye, Caldwell, Fox, Alcegaire, Hluchoweckyj and that's going to be a long day. So, to help spread the workload out, BG has dipped into the football team for a couple bodies. They are Hunter Folkestma and Teo Redding. Folkerstma is a TE on the football team. He's 6'5" and 244, which we could use. He played basketball in high school and was a post player. Teo Redding is a WR who is 6'1" and did appear to be a pretty productive player in HS, based on a google search. Also, here's a big dunk. Of course, the biggest moment in the history of football players on the basketball court was when Cole Magner jumped over and actually played some minutes at PG during the Dakich years. The win over Miami with most of the football team in the house can be reliably referred to as the "Cole Magner Game" to anyone who was there. Keon Newsome also was with the basketball team at the same time, and Shaun Joplin was on the team for a while, though to my memory he only played for a few seconds, and that was to commit an intentional foul. But I could have that wrong. Anyway, also no idea how long these guys will stay with the team. If the suspensions end up being one game, I would suspect that the answer is one game. But we shall see. Thanks for lending a hand, Hunter and Teo! So, with a slight pall on the season, BG heads to the floor of the Stroh Center to take on the Ohio U. Bobcats. They will do so without their leading scorer and their PG, along with the 4th leading scorer and a reserve big man. Now, OU has an issue, too, which is that they are playing without MAC POTY Antonio Campbell, who is out for the season. Despite being 12-6 and the #110 team in the country, they are 4-3 in MAC play. They have lost 2 out of 3 since Campbell went out. And, you'd think BG might have had a shot given that, at home, but with the suspensions that looks a lot more difficult. On the other hand, if you read the book on the '84 hockey team you see that Coach York suspended half the team before a tournament game and BG won...and got the stools...but, you know, '84 Falcons. We'll forgo the usual charts, since they describe teams that will more or less not be on the court Saturday. Let's look at OU without Cambell. First, OU continues to have some very good players. PG Jaaron Simmons is now their leading scorer at 13 ppg to go with 6 assists per game. The latter figure is first in the MAC. He shoots 43% overall and is not a 3FG threat. He's a good player. Some of the numbers also need to be adjusted because he never comes off the court. He averages 36.6 minutes per game in MAC play. (Also, like most top players in the MAC, he is a transfer...in this case from Houston). So G Jordan Dartis scores 12.6 PPG on 49% shooting and 45% from 3FG. He also plays big minutes with 34 per game. Their third leading scorer is MSU transfer Kenny Kaminski, scoring an inefficient 10.9 PPG on 37% and 42% shooting. Fourth leading scorer is Jason Carter, who has moved into the starting lineup with Campbell out. He's a 6'8" FR who scores 10.6 PPG on 48% shooting with 7 rebounds per game, which is pretty good. Mike Laster, a 6'5" JR from Cass Tech has also gotten more minutes and had 14 points in the NIU game but was not a factor in the other 2. OU is second in the MAC in defensive efficiency, so that's where BG is going to have to get some traction. They force turnovers and are tough to shoot again. BG will need to do it without its leading scorer and starting PG. With those four guys, I don't think this game was out of reach, but it is going to be very difficult with a short bench and OU being a pretty good team. #BGSU men's hoops: 4 #Falcons suspended are Ismail Ali, Zack Denny, Antwon Lillard & Rasheed Worrell. No length given for suspension. #BGSU men's hoops: School said 4 #Falcons players were suspended for "failure to uphold standards within program." So, the MBB season has hit an unfortunate turn. 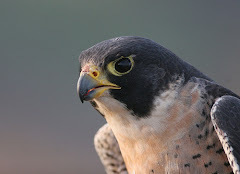 The school announced today that four Falcons have been suspended for an unspecified length of time. You can see above who they are....that's a 2nd suspension of the season for Ali and Lillard. It is very discouraging. This team has enough problems without running up against something like this. I don't recall a recent suspension of this size. Perhaps there was one, but I certainly don't. Obviously puts a different spin on the Ohio U game, which was going to be uphill to start with. Again, no idea if it will be more games. I do have confidence in Coach Huger and his team. I do think he will get it there, and perhaps this is part of that process. But disappointing to have it happen in the middle of an already tough season. BG got half the equation they needed in Mt. Pleasant by holding the high-powered CMU offense down somewhere near a human level. Unfortunately, BG was unable to score enough points to take advantage, losing 82-76. In particular, the Falcons suffered by struggling at the free throw line. CMU bolted out to a 12 point lead with 8 minutes left in the first half. BG eventually got it to 6 before it blew back up to 14 and the half ended with the Chips still holding the 12 point lead. For much of the 2nd half, it didn't appear that CMU was going to have any troubles with the Falcons, leading by something between 9 and 15 until there was about 8 minutes left. Wes Alcegaire nailed a 3FG and got the lead down to 6. It got down to 4 a few times. With 2 minutes left, BG was down 5 and CMU had the ball. They missed a shot and the Falcons had the ball back. This was probably BG's biggest possession of the game and Ali committed a turnover and then CMU ran some clock and ended up with a basket. Now down 7 with :53 left, BG missed a 3FG on their next possession and fouled, giving up a FT, and down 8 things were pretty much over. Those two possessions were BG's last chance. 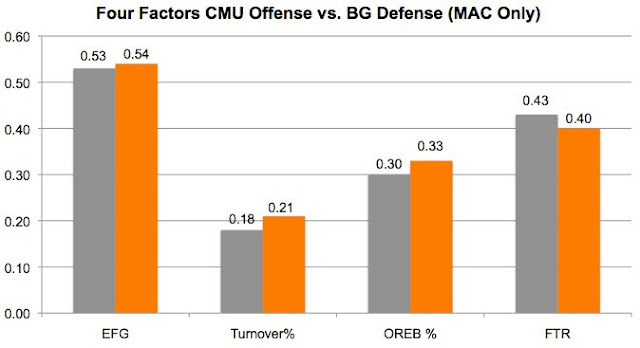 BG held CMU to 1.05 points per possession, their lowest since their first two games of the MAC season (both losses). Unfortunately, BG scored only .97 points per possession, their 4th game out of the last 5 under 1 point per possession. The big story on an individual basis was Demajeo Wiggins who had 11 points and 22 freaking rebounds, the most since Cornelius Cash--who I saw play--roamed the floor at Anderson Arena. Even so, as Coach Huger mentioned, Wiggins was 4 of 10 shooting, which should be higher since it's "mostly layups." He did add 4 assists. Rodrick Caldwell also had 19 points, on 8 of 15 shooting, which is good for a guard. Also, it came in 21 minutes. Both of these guys are young guys recruited by Huger and part of what we certainly hope is the upward trajectory of the program. Wiggins has improved a lot this year and if Caldwell (who is still inconsistent) can make the same progress, things start to get interesting. Wes Alcegaire had 16 on 6 of 15 shooting. Ali, Frye and Denny really struggled. Antwon Lillard had 6 rebounds. So BG joins Miami and WMU at the bottom of the MAC standings with 2-5 records. Ohio is next on Saturday, with a chance for the Falcons to pick up a second straight win on home court. Credit here to Hustle Belt, where I saw this first. BG has another verbal on the defensive side of the ball. This young man is a 3-star recruit and very highly regarded. His name is Caylon May and he is a 6'1 1/2", 305 pound D-tackle from Illinois. Scout lists him as one of the top 5 DTackles in Illinois and #75 in the country. This report has him as the #34 recruit in Chicagoland. According to what he told Hustle Belt, when he made his visit to BG, he decided it was "the place for me." He had reported offers from CMU, WMU, Ball State, Buffalo, Illinois State, Miami, and Colorado State. Even more importantly, he's been heavily recruited since the year after his junior season. The Hustle Belt article mentions that BG is currently #2 in the recruiting ratings and could go to #1 if UT loses Michael Warren. You all know how I feel about recruiting ratings. At the same time, clearly we are getting guys that other schools want. You also know my concerns about this staff, but on the recruiting front they do appear to be showing their mettle. Stand by. Week from tomorrow!!! Welcome to the Falcons, Caylon. So, Tuesday the game at CMU will feature two teams with 2-4 records. CMU has gotten to 2-4 by beating UT and Miami in Mt. Pleasant, while losing @NIU, @EMU, @Ball State and at home to Akron. CMU brings the leading scorer in the nation to the game. Marcus Keene, about 5'9" and a transfer from Youngstown State, is leading the nation with 29.8 PPG. The next guy has 22.3 PPG. He dropped 50 on Miami last time out. He's a scoring machine. Obviously, he shoots a lot, but he doesn't shoot crazy. He makes 47% of his overall FG attempts and almost 40% on 3FG. He's a solid shooter and the most notable player in the MAC this year. He is #4 in the nation averaging almost 4 3FGs per game. He will be the biggest challenge facing the Falcons on defense. Here can we see the contrast this game will offer. CMU plays at 76 possessions a game, which is 2nd in the MAC. 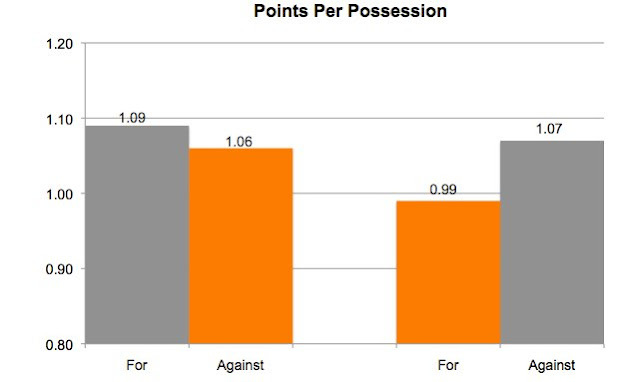 They are third in points per possession on offense and dead last in terms of defensive efficiency. To that point, when BG has the ball, the MAC's least efficient offense will face off against the MAC's least efficient defense....a movable force meets a movable object. We'll see how it plays out. BG is 8th in defense, but has the opportunity to put two strong defensive games together after playing well against a very effective Ball State game. (When BSU-CMU played, it was 98-83 for the Cardinals. CMU gets the offense by shooting well and taking good care of the ball. They are 4th in the MAC in shooting and 5th in turnovers. They are not good on offensive rebounds---that number, though on the national average, is 10th in the MAC, one of the best offensive rebounding conferences in D1. They get to the line and they are 3rd in the MAC in FT%. This is a team that will live and die with the 3FG. They lead the MAC in 3FG attempts as a % of their total shots and make 40%, which is 2nd in the MAC. They get 47% of their points from the 3FG, most in the MAC. They are last in 2FG%. Overall, they are a good offensive team playing against a BG team that has on average been a poor defensive team. 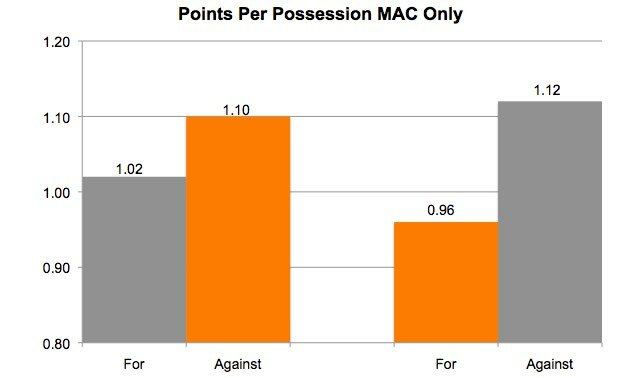 BG is 6th in the MAC in allowing 3FG%. Flipping it around, you see what it looks like when the worst defense plays the worst offense. Everything BG does poorly is something that CMU allows team to do. So, who breaks out of that mold? It will go a long way to seeing who wins. Beyond Keene, the Chips have Braylon Rayson scoring 19 PPG. (Individual stats are all games). Rayson is a lot more inefficient than Keene. He shoots 36% and 35%. David Dileo is scoring 10 PPG a game, on 40%/40% shooting. He is a 6'7" Fr. Cecil Williams leads the team with 6.3 RPG, ...he's a 6'6" SO. Keene, BTW, leads the team with over 5 assists per game...overall he has 100 assists and 82 turnovers, which is not a great ratio. Anyway, this is a winnable game for BG, though they will be strong underdogs. Having said that, we keep waiting to see BG bring strong defense for consecutive games, and if they do it this time they have a shot at picking up this win on the road. BG has another verbal for this year's class. This young man is Calvin Clater of South Hills HS in Fort Worth, TX. 247 has him ranked as a 2-star recruit. They also report he had D1 offers from Texas State, UMass, and Nevada. In fact, until a couple days ago he was committed to Texas State. He de-committed and then he committed to BG. Actually, before that he was committed to Stephen F. Austin. Texas State was moving him to D-back. No idea if we are thinking that way, but see below. He's got good size. He's 6'3" 1/2. This coaching staff appears to have an interest in tall WRs. There's more than one site out there that thought he would end up at Texas Tech for that reason. Anyway, the first is Noah Harvey. He's listed a 3-star recruit on 24/7. He's 6'3" and 210, and ranked as the #10 player in Wisconsin, which is pretty good. His only other reported offer was from Lance Leipold, MR WISCONSIN. Noah is from Hartland, WI, (of course he is) where he attended Arrowhead HS. Hartland is due west of Milwaukee a piece. He was named second team all-area and also second-team AP All-state and made the Wisconsin Football Coaches All-state team. The second is Matthew Guevremont, a Canadian-born OL who is 6'4" and 300. He had a serious knee injury in his first season at Chabot College in California. He red-shirted and then after his next year at JUCO he signed with Arkansas State. No idea what happened, but he ended up back at Chabot, where he had a good enough year to be named first-team All-California. Harvey steps onto a defense with only 6 or 7 scholarship LBS and with senior LBs Austin Valdez, Aaron Banks, and Nate Locke. He has the chance to play a bunch of games if he turns into a player. Guevremont might be able to help us right away. BG had graduation losses at OL and he might be able to start right off the bat. If he does start, 40% of our o-line will likely be Canadian-born. Noah, Matthew...welcome to the Falcons. So, BG picked up their second win of MAC play and their second win over Ball State. If only we could play Ball State every week. Because precisely ALL of BG's wins in the MAC have been against Ball State. Last time we got a little bit over our skiis after the Ball State win and started to get a little optimistic. This time, we're going to wait, oh, let's say until BG can win like 3 in a row before we start to think that we might be starting to gel. For now, we'll take it. BG is 2-4 and needed this win badly. The Falcons nearly handed it back at the end, but got one last play and put it away, 79-74. Things are still tough, but very tough without this win. BG started the game with Dylan Frye in the starting lineup and Antwon Lillard on the bench. Coach said they wanted another ball handler and creator on the floor. And BG certainly got off to a good start. BG was up 15 with 8 minutes left to go in the first half. Ball State ticked it down to 6 but BG went to the locker room up 10. That was a lead BG still held 6 minutes into the second half. But BG went the next five minutes only scoring 1 point while BGSU got 9 to cut the lead to 2. From there on in the game was on. Ball State cut the lead to 1 numerous times but BG was able to bump it back up. The key sequence began with about 1 minute left. Wiggins picked up an offensive board and found Matt Fox in the chaos. Fox drilled the 3 (second huge hoop of the year) to put BG up by 5. With :55 Zack Denny fouled. Ball State made 1 FT. BG by 5. With :34 left Fox gave up a steal but Ball State couldn't convert and Fox had the board. Denny fouled. With: 20 left, Denny splits the pair. BG by 6. (Should be good, right?). With :15 Ball State drills a 3. BG by 3. With :10 left and BSU without time outs, Ali fouls a guy 88 feet from the basket in which is an incredibly bad play. Without, BSU has to take up half the game getting a shot off. With :10 left BG inbounds the ball to Denny, their best FT shooter and SR and he literally fumbles the ball out of bounds. Now, BSU has the ball in the frontcourt with a one possession game. Finally, BG makes a play. Matt Fox tips the inbound, it results in a turnover and Ali ices the game on the other end with a layup. Eesh. But, hey...a win. You build the big lead and made FTs and ultimately made a bad turnover but then got it back. These are the stats of a close game. In fact, they are even in 3 of the first four categories. The biggest issue is the fact that Ball State, which had been scoring like crazy in the last weeks, found themselves being stopped by the BG defense. This was the key. BG had .97 points per possession, which is below their normal average, but held BSU to .91, which is their lowest in MAC play. Their shooting% is the second lowest of the year for them. The previous lowest was when they played BG. Anyway, BG also kept them off the boards, which had been a big issue for the Falcons in MAC play. Ball State hasn't had that low a result since November. Denny scored 17 on a tough shooting night with 4-10 shooting and 7 of 8 from the line and 1 nearly disastrous turnover. Wiggins had 14 on 6 of 9 shooting and 14 rebounds. Ali had 13 points on 4 of 9 shooting and only 2 assists over 4 turnovers. Alcegaire had 10 points on 3 of 8 shooting on what seemed like an uneven day, including 3 turnovers. Dylan Frye, making the start, played 32 minutes without a field goal, missing all 7 shots. He did make 5 rebounds a 2 assists. Off the bench, Lillard had 6 points in 23 minutes. Coach was also complimentary of the play of Rasheed Worrell's play, with 5 points, 5 rebounds and 2 steals in only 11 minutes of play. FWIW, Todd Walker said Jeffrey Uju might be back in a couple weeks. So, the Falcons have a shot now to get a 2nd in a row. They travel to Mt. Pleasant to play CMU. The Chips are beatable, though the game is at home. 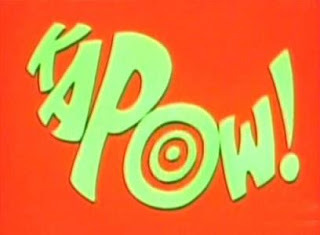 Having said that, Keene went off for a D1-high 50 today. So, as the football coaches work toward another official visit weekend, which is key, the MAC announced the opponents for 2017. Dates and game times are still forthcoming. The idea is that it is the same people we played last year in the MAC, just flipped. This is actually good for BG, who get UT, NIU, Akron and OU at home. That's a good schedule for fans and it is a good schedule for our team having a shot to win the East. Meanwhile, we go to Buffalo, Kent, Miami and EMU. You need road wins to win (even) the East and a couple of those are going to be tough. Especially Miami and EMU, who appear to be on the rise. If you are thinking about winning the East and need to construct 6 wins, and even with this schedule it looks tough. Not sure what the outlook is for NIU....but OU will be a tough game even at the Doyt. Let's say you win 3 home games. You need 3 road games. Even with Buffalo and Kent, you will need to win at Miami or EMU. Or run the table at home. Which would be great because that would mean we beat Toledo. I've said on twitter that I don't think we can really compete until 2018. I just see a lack of playmakers on defense and offense. If we do win in 2017, then we will have answered questions about our coaching. Even in the East, I don't see this clicking out. The non-conference schedule is really tough. Yes, we play South Dakota, who were 4-7 last year. However, BG plays @MSU, @Northwestern and @Middle Tennessee State. That's tough and likely 3 losses. So, if you're looking for a .500 season and a bowl game, you might see South Dakota, Kent, Buffalo, OU, Akron, NIU. 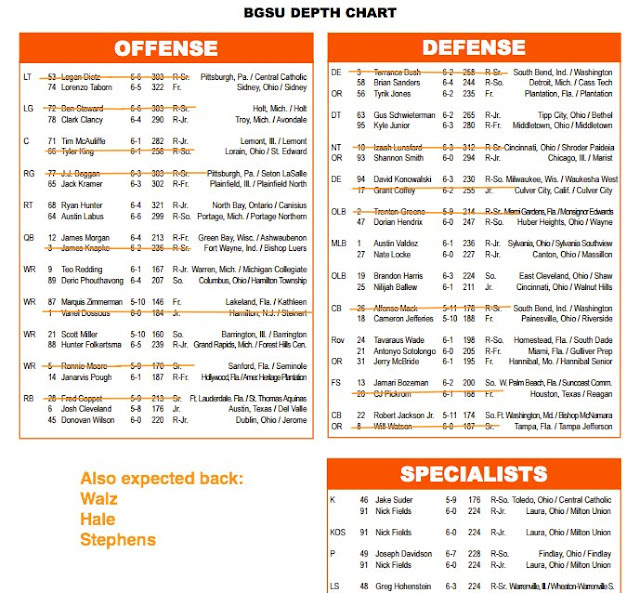 So BG released the latest version of the spring roster and there are a couple significant omissions when you compare it to the previous roster. We also have no idea what happened and a lot of times we don't hear anything. Usually, players just decide college football isn't for them anymore, they are a long way from home, etc. But other things could be at play too. So, the following players are no longer listed on the roster who were expected back. (There are a couple more who were walk-on types). CB CJ Pickrom--This one is most significant. A lack of depth forced him into action but once that happens, things are usually picking up and you benefit from them being on the field. At a positon of continuing need as well. WR Vanel Dossous--He had 9 catches and made 2 starts. Was JUCO coming in, transferring to a DII school. Obviously didn't get a lot of run, but was at a position of need. DL Grant Coffey--California JUCO D-lineman, battled injuries, played in 1 game. Was expected to contribute. RB Charles Lamar--R-FR year, DNP. Was recruited from Florida. DL De'Angelo Ware--Played some in '15. For those of you keeping score on the blame game, 3 of the 5 were Jinks guys. Lamar was in Babers only full-year recruiting class and Ware was a Babers recruit from his first class, which didn't start until late December. These things do happen and, actually, given the instability in the program, it could have been worse, in my opinion. Still, BG has numbers issues and these departures put stress on the system. At this point, I honestly think BG is looking at a 2018 return to competitiveness, but that could change. 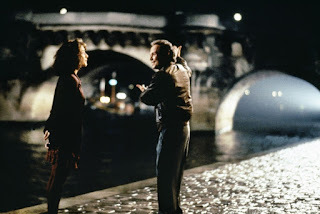 So, you know in the movie Forget Paris, where Billy Crystal is trying to rekindle the honeymoon phase of his relationship with Debra Winger which was in Paris and she's like,"Forget Paris."? Now, for this men's basketball season, it has turned into "Forget Muncie." At the time--following exceeded expectations in Akron and then the road win over Ball State--it felt like things might be coming together. It has not been a good two weeks. Since that, BG has lost all 3 games by 10+ points, with two of those games at home and the players were called selfish by the Coach. No good at all. And for a team that was pinning its hope on some close losses in the non-MAC season, losing by 28, 17 and 12 in consecutive non-competitive CONFERENCE games was sobering. As this rematch will be if BG doesn't get things squared around. This game is literally two weeks since the last one, so here's the first preview, which still should suffice. Whats happened since then? Well, we've covered that story for BG. Ball State is 3-0 since we played them. The beat Miami at home, Buffalo on the road and CMU at home. In that stretch, they are scoring like crazy. No fewer than 85 points in any game. Offensive efficiencies of 1.17, 1.24 and 1.26 per game. BG's highest is 1.17, which was Akron. The Cardinals are hot. They are shooting 42% from 3FG over those 3 games and 61% from 2FG. They remain the best FT shooting team in the MAC at 78%. So, here's the thing about the win in Muncie. They didn't make shots and they didn't get to the line. Whether it was BG's defense or cold shooting....and BG is 10th in the MAC in conference play at defending the shot, including this game....but Ball State didn't put the ball into the basket and only had .99 points per possession. Also, they turned the ball over a lot, something that also plagued them in their next day against Miami but they cleaned up for the next 2. Now, maybe Ball State has been hot for the last 3 games. And, to be sure, they are unlikely to continue shooting like that, even if just considering regression to the mean. But, they are also unlikely to be down around .99 points per possession again. And BG is the worst offensive team in the MAC in conference play, so either we get really hot (unlikely) or we have to keep them within reach. Tayler Persons had a huge game last time for BSU. He scored 21. Franko House had 16 and 10. Sellers, Kiaway, Weber and Tyler all had very long shooting nights from beyond the arc. Those guys have heated up since then. For BG, the Falcons had a strong game from the starters, something that has not been typical, based on Coach Huger's comments from post-games. So, it is a new day. Forget Muncie. Both teams will need to change their trendlines for BG to win this one. BG lost 85-73 to the Toledo Rockets at Savage. That's 6 straight to the Rockets and 3 straight this season....not to the Rockets, just in general. There's not a good feeling that comes from losing to UT. They are the better team and have been for a few years, really since Kowalcyk got things going after the Gene Cross debacle. And this year's first matchup was really more of the same. BG had a run in the first half to take the lead 32-30, with 4 minutes left, but UT went on a 13-0 run to close the half out. UT led the rest of the way...they used an 11-0 to stretch the lead over 20 and though BG kept playing, they couldn't get closer than 9 and that only happened once. Essentially, for the last 24 minutes of the game it was no contest as the Rockets cruised to the win. So, at least on this night, they remain the better team. And there is nothing good about that. Coach Huger is unlikely to be too happy with his defense after this game. It was a tough assignment going in. 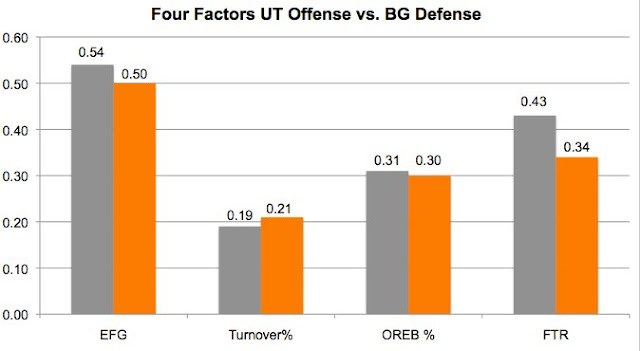 UT, as noted in the preview, is a highly efficient offensive team. They were here as well. 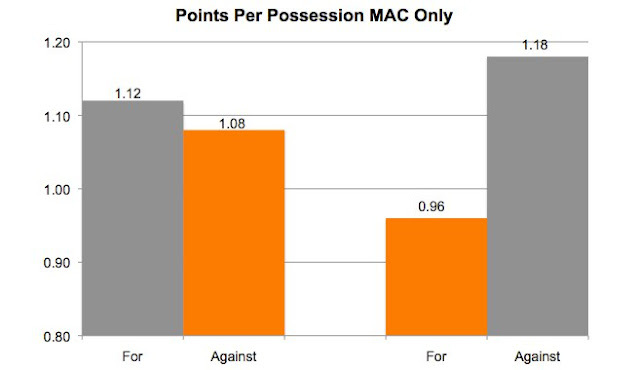 UT scored 1.16 points per possession, the 3rd outsized offensive game BG has allowed in 5 MAC games. UT got there by shooting 61% from 2FG and 45% from 3FG, both of which are really good numbers. They also got to the line 31 times--BG was fouling a lot at the end. UT was 18-31 at the line...but players not named Stevie Taylor were 18-23. Taylor dropped a bagel on 8 FT attempts. 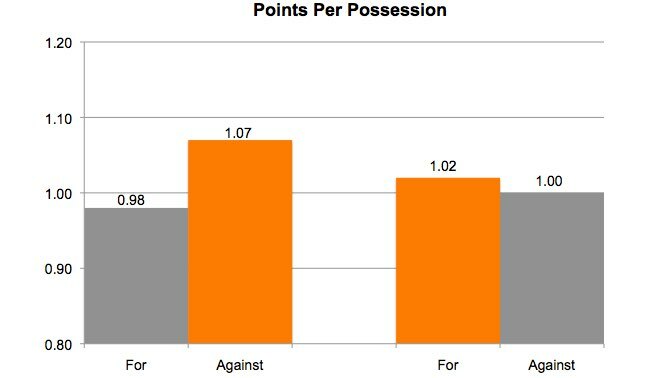 Anyway, BG end up with 1 point per possession, which is below the current D1 average. BG shot OK on 2FGS (52%) but really gagged it up on the 3FG, making only 3-19. Denny missed all 5 of his attempts. BG had a big game on the offensive boards--which helps that 2FG% as well--but only shot 12 FTs, making 8. Overall, BG was -10 at the line. Coach Huger called out the Falcon starters after the NIU game. I'd say he got a much stronger performance offensively from them, though he may still not be happy with the defense. Wiggins double-doubled with 17 points on 6 of 9 shooting and 11 rebounds. Alcegaire had 14 on 6 of 15 shooting, 7 rebounds and 4 turnovers. Denny had 12 but it took him 5 of 15 shooting to get there. He also had 7 boards. Ish Ali had 9 on 4 of 12 shooting, but added 8 assists over 3 turnovers. Dylan Frye scored 9 points off the bench. BG played a much shorter rotation. The top 6 players went 175 of the game's minutes. So, back to the Stroh with a return engagement against Ball State, against whom BG experienced their best moment of the season. at 1-4 in MAC play, things have rapidly sunk to a bad place. So you are no doubt acquainted with BG's losing streak to UT in football. You may be less acquainted with the streak when you add men's and women's basketball in. It isn't good. Toledo has won the last 5 and the last win for BG at Savage was in 2011. At the end of a pretty down presser after the NIU loss, Coach Huger had a laugh about it, saying that BG usually comes to play against Toledo, but it would depend on which BG team shows up. He said it would make us hard to prepare for, because "if I don't know, they sure don't know." One thing....as far as I can tell when Chris Kingston left we got to unburden ourselves from #talonsup and all the coaches could stop saying "the school up North," which was stolen from Woody Hayes anyway. So, maybe that will help us turn it around. The football team certainly brought its "A" game into the Glass Bowl, but, alas, it wasn't enough. Whether it will be on Tuesday remains to be seen. If the BG team shows up from the EMU and NIU games, I can 100% guarantee you it will not be enough, but let's hope Coach is able to get these guys to bring their games around. Right now, we're not any better than we were when he got here. UT is 9-8 on the year and 2-2 in MAC play. In common opponent land, they beat Detroit, as BG did, and they also beat Evansville, which BG did not. They also lost to Green Bay, which BG also did. In the MAC, they beat Buffalo and Miami at Savage and then lost @WMU and @CMU. They have a kenpom of 139 as opposed to BG's 249 and they are heavy favorites in this one. That fear is reinforced here. They are very strong offensively. They are the #75 most efficient offense in D1, and, as you can see, BG's defense has continue to slip in MAC play. (BG is #222 in the nation). This is exactly what Coach Huger was complaining about during the NIU presser. Anyway, the problem is UT scores well and we are currently easy to score against....AND then the reason UT is 9-8 and 2-2 is that they are relatively easy to score against (worse than BG) but BG's offense is #251 in the country, so will the Falcons be able to take advantage? Note. UT plays at NCAA-average tempo, so it is an execution thing as opposed to a tempo thing. On offense, UT excels really in two areas...they are a very strong shooting team (#54) and they are really good at getting to the line (#30)....and average at making them. They combine that with not having any real weaknesses....on turnovers and offensive rebounding they are right on the national average. The worrisome thing is the shooting, because BG has been poor in that area. The other areas are pretty close and if playing well, BG would hope to keep them off the line. As for shot selection, UT takes a normal amount of 3FGs for a D1 team. They 35.2%, which is a little above average. Where they excel is shooting the 2FG, which they are #39 in the country at. 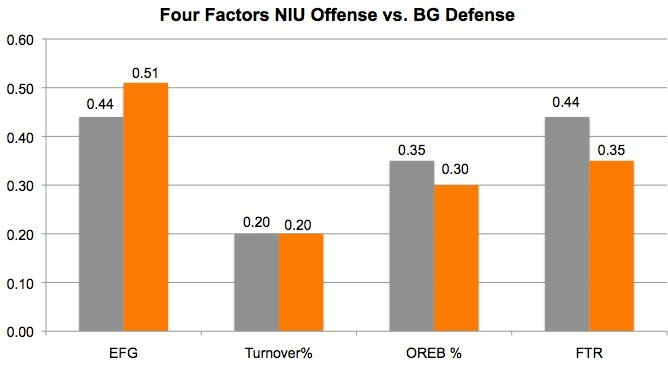 In 3 of BG's last 4 games, the Falcons have been terrible defending the 2 and they had better have that sorted out....this team is not NIU. UT is also easy to shoot against. They are #306 in defending the 2FG and it is my view that this is the challenge for BG. The Falcons just have to get this part of the game going. I know Coach Huger says we need stops to get the offense going and that's fine, but BG isn't going to beat anyone scoring like they did (or didn't) last week. UT also rarely forces turnovers--they are among the bottom five in the country in that stat. However, they take good care of the defensive boards (#20) and don't let teams get to the line (#97). The top player for the Rockets is Steve Taylor, Jr. The Marquette transfer is scoring 15 PPG on 53% shooting and also averaging over 11 RPG per game. He's #5 in the nation in rebounds, #2 in defensive rebounds and #3 in double-doubles. He's 6'9", 240 lbs and a SR...and projects to be a lot for BG to handle. Jonathan Williams is #23 in the nation in scoring at 21.1 PPG. He is efficient, shooting 47% and 39%, both of which are really good. Also, 80% from the line. Jaelan Sanford--a 6'4" SO from Evansville--is scoring 14 PPG on 42% and 36%, which is obviously less efficient. So there you have it. Rivalry game. Be a GREAT time for the Falcons to get well. And it is certainly possible, with a new focused team, if Coach Huger can get them there. A win is badly needed. A loss means you fall to 1-4 and even a home game in round one starts to get unlikely. Lots of basketball to be played, though. Still time to change what direction we are headed. R-So O-lineman Tyler King announced on Twitter that he is leaving the program...and football. He has a herniated disk and has decided to leave football to protect his health. He has the full support of the Falcon Nation as he heads into coaching. Best of luck Tyler, maybe someday you will roam the sidelines at the Doyt. Back in May, CJ Hunt, a DT from Indiana, committed to BG. (Here is what I said at the time). He's decided, as you can see, to play at EMU. We wish him the best. This is a big decision...one of the most important a person makes, so he gets to pick the school that's best for him. Ouch. Yeah. This is as bad as things have looked in a long time for BG's Men's basketball team. Things can really change in 7 days. You lose by 28 and 17 in two games in the same week at home....to teams that are in your conference....and in one of them you have your coach saying that you had guys not showing a lot of effort and energy and in the other one you have him saying guys are selfish. In other words, it isn't just the losing, but why you are losing, which is selfish players not playing with energy, especially on defense. I mean, I can see Kobe Bryant being selfish. Iverson. Carmello. On a BG level, it is one thing for Antonio Daniels to be selfish. But we don't have anybody on this team who should think that they're entitled to being selfish. (Note: Coach is also talking about guys who want to play offense and not defense). You can watch here for Coach Huger's presser. He's pretty direct about who he is talking about and what he sees happening. Also, after the game, Coach said he is going to look at adjusting the starting lineup. FWIW, the lineup that started the second half had Dylan Frye starting in place of Lillard. It wasn't a great day for the sport in general. Seven minutes into the game, it was 8-8. Then, NIU went on an 8-0 run...meaning that they led 16-8 with 8:44 left to play. (Oh and that 8-8 moment? That was the last moment when NIU was not in the lead). BG whittled it back to 1 and then it got back to 8 before the Huskies led by 6 at the end of the first half. Five minutes into the second half, BG was doing all right, down only 2 at 39-37. Then, NIU went on an incredible 17-0 run over about 7 minutes. BG got the lead down to 11 in the final minutes, but the game was way over at that point. That's a 69-52 defeat for BG. The stats are interesting in that they are not as one-sided as you might expect. Neither team shot very well and both teams had a lot of turnovers. Basically, NIU got off 8 more shots than BG...that's from 4 more offensive rebounds and 4 fewer turnovers. Those eight shots were enough for them to be +8 on FGs and then they were 15-18 from the line and BG was a poor 6 of 13, so that's where the other 9 come from. BG had .69 points for possession, which is their worst since January of 2014 when they lost 45-36 to these same Huskies under Coach Orr. They allowed NIU .92 points per possession, which is not a bad defensive day overall but obviously not enough to win when the offense is as poor as it was. Individually...uh...yeah. Ish Ali actually had a really strong game. He had 16 points on 7 of 11 shooting and 6 assists over 2 turnovers. Dylan Frye also had an effective game, with 13 points on 5 of 8 shooting. Zack Denny had 11 rebounds. Wiggins, Alcegaire, Lillard and Fox? They had days they'd rather forget. Coach also mentioned that Malik Hluchoweckyj played good defensive minutes as did Rasheed Worrell. So BG is now 7-10 and 1-3 with two home losses in one week in non-competitive games. Next up is UT @Savage Hall next week and then a return engagement with Ball State on Saturday at the Stroh. Coach Huger has got some work to do, as the team loses and does it as much for effort and teamwork issues as for talent. That's tough to fix mid-stream, but if they aren't careful the season is going to have passed under the bridge before it even got started. Up or Down? Falcons play Huskies. So the next team on the docket is Northern Illinois. This is going to be one to keep an eye on. BG had the good win a week ago and then a total crash and burn on Tuesday, so this is one the Falcons are going to need. Again, we are trying to see if they are who they were thought to be or if they can exceed it. Most of the year they have been pretty much as expected. Falling to 1-3 in the MAC with 2 home losses will make the rest of the year tough to put together. NIU is 10-6. The follow the EMU scheduling plan, except they have only played 3 non-D1 games. On the other hand, after Tuesday, maybe that's the secret. Anyway, they are 7-6 except for those games. Their best win was #197 Indiana State in the non-conference and they lost to the same Sycamore team as well as two others ranked in the 200s. Then they opened the MAC season with a loss to Miami at Millett and things weren't looking right. Then, they rallied and beat CMU and Kent (erasing a 13-point 2nd half deficit) in DeKalb for their two best wins of the season. So, they are 2-1 in the MAC. The Huskies beat BG by 11 last year in DeKalb and the Falcons swept them the year before that. NIU is a little different from Kent and Ball State, which is to say they are a very poor team on offense. Their offense is #285 in the country. The problem is that the Falcons are in the defensive doldrums. Two of the last 3 games they have been torched, which has made them #227 in defense. So, those two "forces" will be at play Saturday. On the other side, NIU is very good on defense--that's the #80 defense in the country. And, of course, BG struggles to score. NIU is very interesting. They are terrible shooting and protecting the ball. In fact, their shooting is in the bottom 15 in the country and turnovers are above average. However, they are very good on the offensive rebounds (#33) in the country and in getting to the FT line (#13). That's a worry because Bowling Green has yet to have even an average game on the defensive boards in MAC play. NIU is good at getting to the line and average at making FTs. They take a very low number of 3FGs...they are #340 in the country at frequency and #345 at making them. And they are #300 at making 2FGs, so you can see where the poor shooting comes from. When things flip around, as expected they are more evenly balanced. NIU is a decent defensive team and BG is a poor offensive team. They do force turnovers--a worrisome thing after the EMU game--but the remainder of the stats are pretty evenly matched. NIU only allows 46.7% on 2FGs, which is really good and will put pressure on BG's most effective method of scoring. Like Akron, NIU plays a very deep rotation. They have 10 players who play 10 minutes a game and only one player who plays more than 30. They also have very balanced scoring. They have five players between 8.6 PPG and 13.8 PPG. They are led by Marin Maric, their 6'11" SR Croatian C. He scores 13.8 PPG on 55% shooting and 6.8 RPG per game. Sr. G Aaric Armistead is also a double-figure scorer. He scores an extremely inefficient 10.1 PPG on 32% FG shooting, which is something you can see in the stats above. Their 6'8" SO F Jaylen Key also averages 5.3 RPG. This team has the kind of height that might make it really difficult for the Falcons. They certainly had similar issues with EMU's height. Still, at home, this is one BG really needs. I mean, not like a title is at stake, but if you'd like to see the MAC season stay interesting as long as possible, then BG needs a win in this one. Prosperity rose up and punched the BG men's basketball team right in the mouth on Tuesday at the Stroh. Riding high off the road win @Ball State, the Falcons responded with a lifeless and unenergetic performance on the way to being destroyed 81-53 by the EMU Eagles...at the Stroh. The most surprising thing is that Coach Huger talked about this being the third time this year that the team has battled this particular affliction. In other words, it is surprising to me how little prosperity it takes to trigger it. The game was never especially close. The first half wasn't too bad. Although EMU led by as much as 13, the Falcons had it down to 7 by halftime. The Eagles scored the first 10 points of the second half to go up 17 and the game was never closer than 12 the rest of the way. EMU led by 20+ points for the last 6 minutes of the game. That's a 45-24 second half beating. BG shot 8 of 23 with 9 turnovers while EMU shot 65% with 7 turnovers. And you just hate to see that in front of your home fans. It just is so disappointing to not even be competitive at home against a team in our conference...this wasn't UC. They are a fine team, but they are a MAC team and a 28-point defeat at home is extremely disappointing. After the game, Coach talked about players who don't play hard riding the bench. In this case, Ali played 4 minutes and Alcegaire 3 in the second half. Meanwhile, Frye played 18, Caldwell 16 and Fox 12. (Note: Justin Turner re-injured his hamstring against Ball State and is out for an uncertain period of time). The game had only 63 possessions, so take that into account when you look at the score. BG had .84 points per possession, their lowest since the Green Bay game and breaking a string of 7 straight games over 1 point per possession. 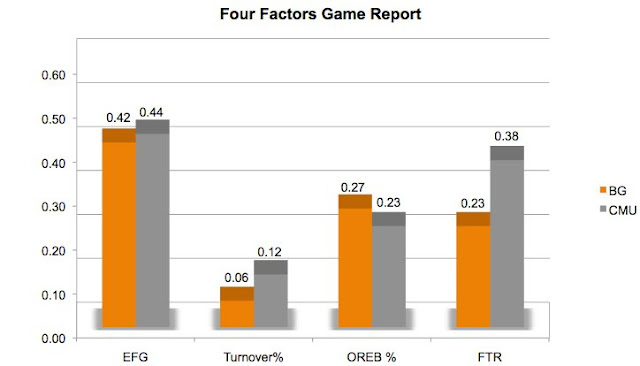 BG gave up 1.28 points per possession, a total that was bettered only by the Bearcats among BG's opponents. The stats are pretty much what you would expect. BG had their worst shooting and turnover games of the year, and couldn't make that up with good offensive rebounds and FT rate (BG made only 57% of its free throws). Meanwhile, EMU had a huge shooting day, took average care of the ball, was equally good on the offensive boards and didn't get to the line as much but made 86% of the shots. Zack Denny had a tough 14 to lead BG in scoring. He shot 3 of 8 and had 6 rebounds. Wiggins had 11 and 7 on 4 of 7 shooting. Frye had 8 on 4 of 10 shooting and Caldwell had 7 points on 2 of 4 shooting, 5 assists and 0 turnovers. So, next up is NIU. At 1-2 with a home game, this is the kind of game you need. It won't be easy but it is doable. I continue to be concerned at the times that our team has effort issues. (Note, this isn't me talking, it is Coach Huger). It is a reflection on the entire program. I just don't think that's right. I don't think the MAC should allow it. I honestly think teams should only play 1 non-D1 game per year. So, while EMU is 9-6, they are only 5-6 in D1 and 1-1 in the MAC. They did play some real non-conference games. They lost @Pitt, @SMU, @Vermont and @Syracuse, all top 100 losses. (The others are @IUPUI and Buffalo at home.) They are 0-5 on the road. This is their first MAC road game. The stats below are based on D1 games only. As you can see, this game should be pretty even. EMU is a pretty good offensive team at 1.07 points per possession, and BG's defense has been less than stellar, at 1.05 points per possession. The D1 average is 104.4. 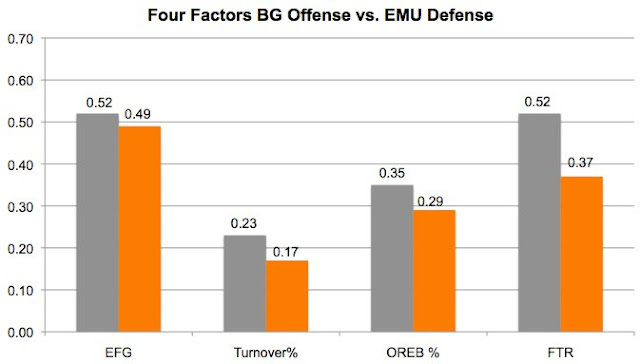 EMU plays at 70.5 possessions, which is about .5 a possession less than BG per game. With that, they scored 94 against Omaha, 87 against Detroit, 98 against Long Beach, 85 against CMU and 77 against Buffalo. 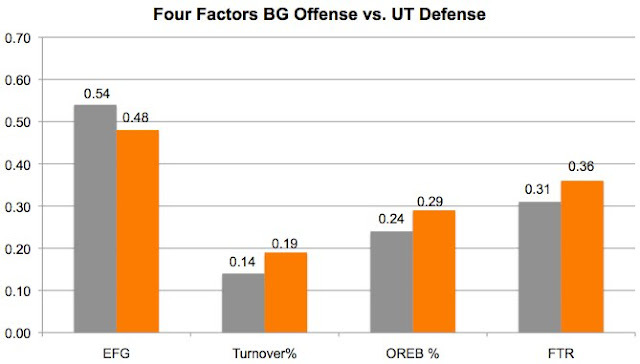 On the other side, they are above average on defense and BG is below average on offense. Now, that has been changing a little bit and if BG can continue to score more consistently, they might turn those numbers around. 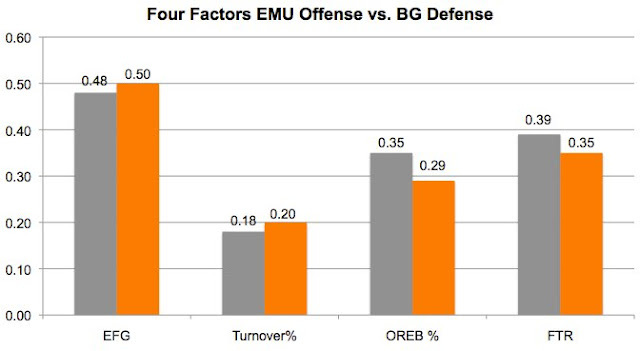 If everyone plays to the average, then EMU would win, so you'd hope for BG to play better both ways at home. It is interesting. Unlike most teams with a strong offense, EMU doesn't shoot very well...below the NCAA average. Having said that, they are excellent in all 3 of the other areas. They take care of the ball, are #42 in the nation in offensive rebounding and they get to the line. They are also excellent at the line when they do get their, shooting 75.5% and being #34 in the country in that stat. This is a challenge for BG, who gave up 38% offensive rebounds to Akron and over 50% against Ball State. If BG can keep EMU off the boards, you eliminate one part of their remaining 3 areas. I don't know it for a fact, but Akron and Ball State were both teams that shot the 3 a lot, and BG defended it really well on Saturday. Whether that plays into the offensive rebounding, I don't know. EMU is #269 at how many 3s they take and #309 at making them, so BG should be able to pack it in a little more. EMU makes only 48% of their 2FGs, which is just below the D1 average. Individually the stats are for all games. Their leading scorer is Willie Magnum IV, who has started only 2 games this year. He's scoring 16.7 PPG on 42% shooting overall and 36% shooting from beyond the arc. He's tried 121 3FGs in 25 minutes per game. That's #45 in the country. He's a SR G who was a JUCO transfer. The next leading scorer is Ray Lee, a R-SR G. He scores 15.6 PPG but inefficiently, on 40% and 32% shooting. Their third leading scorer...and probably best player...is James Thompson IV, who scores 14 and has 10.8 RPG. He's a 55% shooter who is 6'10" and 220 pounds and presents an immediate challenge to BG. Finally, Tim Bond leads the team with 3.5 assists per game. I think this game has the potential to be really interesting. 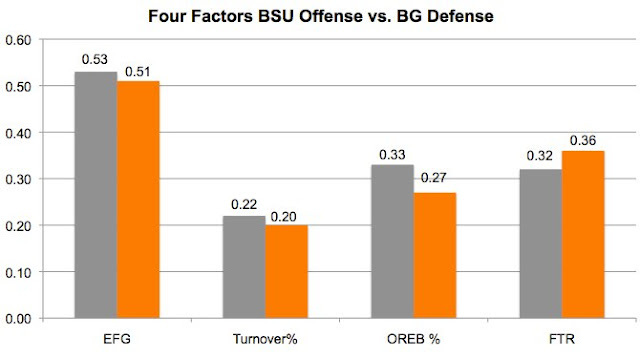 BG is playing better and probably is a better fit against EMU's offense than they have been. Having said that, they will have to manage Thompson, clear the boards and continue to make shots on the other end of the floor, as well as convert FTs. This is a game that could go either way. Kenpom makes BG a slight underdog. BG has 2 home games this week and they are not against the MAC's top teams. If they can hold serve, they can get off to a very nice start and continue to build confidence. Last year, BG won only 1 game at home in the MAC, so doubling that total before the middle of January would be good. Now that the semester has started, BG is able to talk publicly about their football early enrollees, both of which have been known for a while. They are QB Jarrett Doege and WR Mike Wilcox. You can get more info about them on the BGSU website, but my take would be that they both can have an impact by coming in early. Doege will join Elijah Cunningham to provide BG with critical depth at the QB position and possibly push James Morgan, who you would expect to start. Even more importantly, Wilcox and JUCO WR Datrin Guyton would have the chance to play immediately if they make progress during the spring. 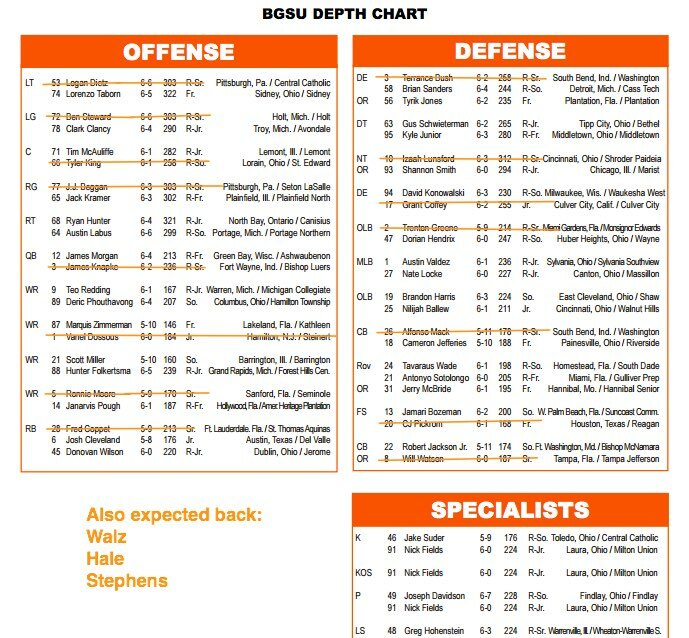 BG had depth issues at WR and Ronnie Moore has graduated. Scotty Miller is back (along with others), but you need a lot of WRs in today's football and these guys could be on the field right away. Welcome to BG Jarrett and Mike. Go to class. Do your homework. Today was a fun day to follow the Men's basketball team. I had a feeling in the preview that things we starting to come together... that the Akron loss presented an opportunity for BG to put 2 strong games together and get a road win in the MAC. Ball State isn't a great team...and they aren't a bad team either. And it was on the road. There's still a long way to go, but the team that played out there today looked a lot different than the team that played, say, against Alabama A&M or during one of those stints where the starters all got benched. BG got production from a number of different places and right now is looking a lot more competitive than we might have thought they would 3 weeks ago. BG came out and had a 6 point lead about 7 minutes in. Then, Ball State went on a 10-0 run to go up 4. That's pretty much where it stayed until halftime--it was tied once more--but the Cardinals went into the locker room up 3. In the 2nd half, BG took the lead with about 16 minutes and held it until the end of the game. That is the kind of thing you like to see...just a consistent second half effort that had some runs, but never to the point where BG gave the lead up. BG was up 12 midway through the half and up 10 with 5 minutes left. By now, the major development in the game had occurred, which was that BG's PG Ish Ali had fouled out. He picked up his 4th and then lost his cool in a resulting frakas and picked up a T and that was it. So, BG played the last 6 minutes with Caldwell at point. He has played extended minutes and he did a great job in this game...Coach praised him after the game for his play on both ends of the floor during the game's closing stretch. Anyway, BSU combined baskets on 3 straight possessions with 3 straight stops and the lead was down to 3 with 4:05 left. BG had one of those 1-minute possessions due to offensive rebounds, which killed clock but was ultimately not productive. Ball State scored with 2 minutes left to cut the lead to 1. At this point, the Falcons had to be having a sense of deja vu after similar occurrences throughout the year. Except this time was different. And mostly, Antwon Lillard was different. With 1:47 Lillard hit a layup to put BG up 3. BG got more or less 2 stops in a row due to a turnover. One of those was a blocked shot by Lillard. BSU carved the lead to 1 with about :30 left, but Lillard came back one more time with a layup and BG was up 3 with :25 left. Even so, BSU had the ball and plenty of time to either tie the game or put the pressure onto BG with a 2-pointer. They missed a shot, got the board and then lined up for a 3FG with :12 left when Zack Denny just made a huge play, blocking the shot without fouling. The blocked shot went OB and Ball State got one more wild 3FG off and Denny rebounded the miss, they fouled him, he sunk both FTs and it was over. So, no deja vu. This time, BG closed the door. They also ended up with a much more complete effort than we have seen in previous games. BG had 1.06 points per possession in a 72-possession game. That's an average tempo and a good offensive performance. The key was on defense...BG allowed Ball State, a pretty good offensive team, only .99 points per possession, which is a total that is tough to win with. This came from BG performing better in 3 of the 4 areas. BG set itself apart with 3FG defense. They held BSU to 16% from 3FG, by far their lowest total of the year. They made 4 and have not won with fewer than 7 this year. BG shot 46% and 36% and ended up with a better shooting day overall. BG also took care of the ball better than Ball State. Finally, BG had the big advantage at the free throw line. The teams had the same number of fouls, but BG shot 19 of 26 from the line and the Cardinals were 11 of 15, leaving BG +8 at the line. It is a good thing they had those 3 advantages, because for as well as BG did on the 3FG and turnovers and free throws, they had a dreadful day keeping Ball State off the offensive boards. 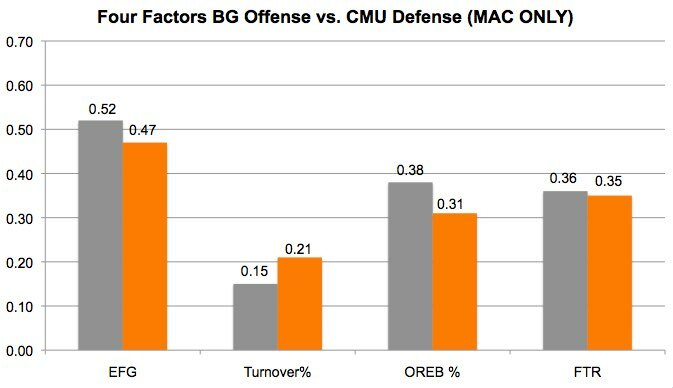 In fact, BSU got more than half of the available rebounds, which is BG's worst game since CMU in 2012. Individually, BG had a few strong performances, which makes it much easier to win. Zack Denny had a big game. There was a time when he was mostly known as a long distance shooter, but today he showed a really complete game. He scored 15 points and tried only 2 treys, missing them both. However, he was 5 of 11 shooting overall, therefore 5 of 9 from 2FG to go with 5 of 6 FTs, 8 rebounds, 3 blocked shots, 4 steals and 2 assists. In the last minute he had a block and nailed 2 FTs. He reminded me of Scott Thomas out there. Antwon Lillard also had a big game. He has been in a little bit of a sophomore slump this year. Going into the Akron game he hadn't been in double figures for six games and had been only in double figure 3 times all year. In Muncie, he had 19 points on 7 of 12 shooting, 1-2 from 3 FG, 4-6 from the line along with 8 rebounds and 3 assists. Demajeo Wiggins also played well. He scored 17 points on 6 of 11 shooting and 5-5 from the line. He also had 8 rebounds. And, while it didn't generate a lot of numbers, Rodrick Caldwell deserves credit for running the offense with a steady hand after Ali fouled out. He ended with 8 points, 1 assist and only 1 turnover. So, BG is 1-1 with a road win in the MAC. They have their next 2 at home and if they can continue to play well are in a position to get a good start. There's a long way to go and I'd advise enjoying this with nuanced expectations as we move forward, but I do believe things are trending up for the program. After a lot of close losses, BG exceeded expectations today, and there's nothing wrong with that. So, here we go. Onto Muncie for game 2 of the MAC season. I'm probably not being smart, but I am really looking forward to seeing this game. BG put together a nice performance--albeit in defeat Tuesday--and I'm excited to see if they can string some of those together, because this game is one you could win with a similar effort. Not that Ball State is a bad team or will be easy to beat. They are 9-5. However, according to kenpom they played the second weakest non-conference schedule in D1. They beat no team ranked higher than 228 and six wins were over teams ranked 300+ and one was a non-D1 win. So, I think it is safe to say that we don't know what we have here yet. (BG played the #329 ranked schedule, so it isn't much different). They are 0-1 in the MAC, dropping a crazy 100-90 game at Kent on Tuesday. (Great quote from Coach Whitford: "I'm disappointed we lost, but I'm not losing my mind.") That was an 82 possession game in regulation, which is atypical of those two teams and, more or less, any two teams. Anyway. For the year, BSU is at 70 possessions per game, which is slightly above the national average. This team is slightly above average on offense and slightly below average on defense. 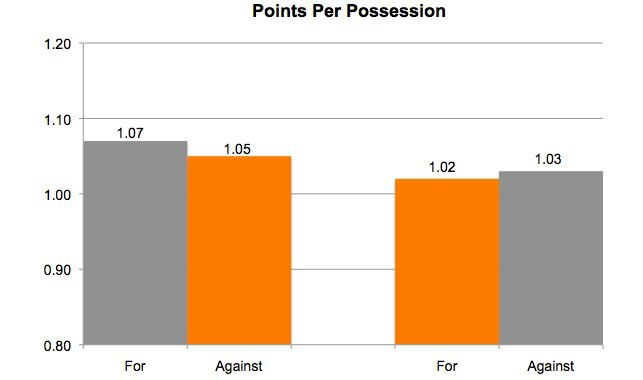 (National is 1.037 points per possession). As you can see, that compares to a BG team that is a little above average defensively and below it on offense. Still, all these stats are in the same range, and Ball State gave up 1.22 points per possession to Kent, an OK offensive team but not a juggernaut. If BG can shoot like they did Tuesday, I think we have a shot to compete. When BG has the ball, things are pretty predictable. Most of these numbers are really close. 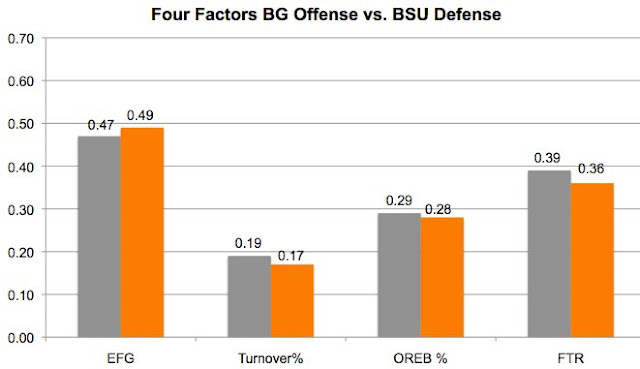 BG's offense has been about as productive as the offense of Ball's opponents this year. So I think we know what to expect. (Note: Kent made 31-31 from the line Tuesday). Flipping it around, Ball State's offense is actually similar to Akron's, just not as good. They are the #76 shooting team in the country, with 51% from 2FG and 38% from 3FG, both of which are pretty good. 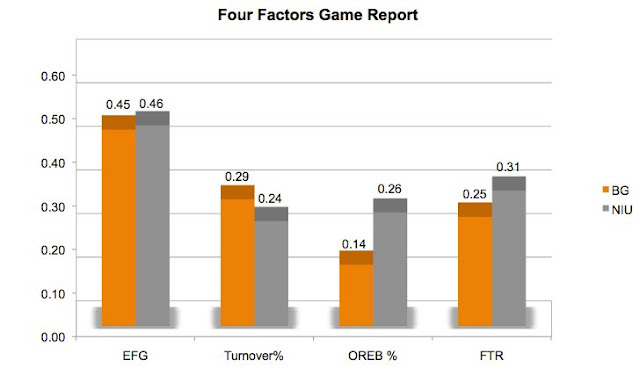 They shoot 39% of the FGS from 3FG, which is about a percent or so above average, so they are nowhere near as 3-dependent as Akron and they don't have Isaiah Johnson, but still, this is a team that can shoot. They are also good on the offensive boards, like Akron, and this is an area BG has to take care of. Ball State is poor at taking care of the ball and doesn't get to the line a lot, and shutting off the boards would be a big help to keeping them off the scoreboard. In what appears to be a MAC trend, their best player is a transfer. Tayler Persons, a 6'4" G who transferred from Northern Kentucky where he was Atlantic Sun Freshman of the Year, leads the team with 15.8 PPG on 47% and 42% shooting, both of which are solid. He also averages 5.2 assists per game, although with 3.3 turnovers. Our old friend Franko House, a 6'6" Sr, is scoring 11.5 PPG on 52% shooting and 6.1 rebounds per game. Sean Sellers, a 6'6" JR and former MAC Freshman of the Year, is scoring 10.5 PPG on 47% shooting. Ball State is like Akron in that they play a very long rotation. No player plays more than 29 minutes and 9 players play 14 or more. So there you go. I think it sets up as an interesting game and a good opportunity to BG, who has not really exceeded expectations at any point this year. An early MAC road win--and then two home games next week--would be a good start. We've entered conference play and that means the MAC is done playing with the other boys in the other neighborhoods. The first big takeaway is that the MAC did not have any signature upsets. No wins over P5 teams or even a team in the top 100, via kenpom. Last year, the MAC had 4 wins in the top 100. So for this year, here is how it shakes out. This is pretty much what you'd expect, I think. The bottom one is a pretty good track record...beating teams you should beat. I suspect you'd like to be closer to .500 in the 101-200 category, but who knows? The MAC lost no games outside of D1. Biggest win is EMU against #101 Omaha. Biggest away win is CMU @#139 Green Bay. Worst loss is WMU to #344 UTEP. I think the scheduling is interesting. One of the things you see when conferences upgrade their basketball is they stop playing games against the bigger conferences in return for home games and winnable games. It is kind of a paradox. You move your reputation up, but you never get to show anyone the big win. This is partly an unfair game, since you never actually get to play any of those games at home. This year, the MAC played only 2 games against the Big Ten. A couple years ago it was 10. (BG played no P5 games and, in fact, played only one major opponent and that was UC). The MAC is the #13 ranked conference on kenpom. #12 last year. #11 the year before that. #14 before that. Marcus Keene....leads the nation in scoring with 30.1 PPG. That 5 more than the #2 guy. He's 5'9" and 175 pounds. Youngstown State transfer. Shooting 47% and 39%, which are really good for a G. He's also averaging over 5 assists per game. Jaaron Simmons is #3 in the nation in assists. Transfer from Houston. Isaiah Johnson #8 in FG%. Yes, BG lost their 17th straight to the Akron Zips. On the way, however, they played their best game of the season. Their pre-conference season was pretty lackluster---there were some close losses and a couple decent wins, but overall a team that seemed to be about what they were projected to be, which would be a road team in the MAC tourney. That's still probable. But the Falcons did put together an effective performance on the court at Akron last night, and if that can be built on, then we might be seeing the start of a resurgence of Falcon men's basketball. The final score was 89-84. The game had a lot of streaks, but BG succeeded in never letting Akron get out of touch and therefore was able to keep the game as close as it was. BG broke out to an 8-0 lead, but then Akron came back to lead 18-11. BG had it back to 20-19 with about 8 minutes left in the first half and took a 31-30 lead with about 3 minutes left. Akron finished the half only up 2. The second half started with much of the same. Four minutes in the game was tied. The Zips went on a 13-2 run to go up by 11 points, but then BG went on an 11-1 run to get it back to 1 with about 9 minutes left. The Zips then did what they do, which is to take advantage of 2 BG turnovers and get a little mini run to go up 7 with 6 minutes left. They had the lead up to 10 with 4 minutes left, but the Falcons continued to battle. Just inside 2 minutes, Matt Fox drilled a 3 to cut the lead to 4 and then Caldwell got a steal and BG had a chance to make it interesting. Caldwell fired a transition 3 that didn't go down and from there Akron ground out the win. BG never had the ball with a one-possession deficit in the last 2 minutes. So, look. Akron led for 32 minutes of the game and clearly is the better team. But, it was BG's best performance to date and if that kind of thing can be strung together for more than one game, BG has a shot to poach some wins, starting Saturday. The key thing above all else was the play of Demajeo Wiggins. If he can continue to grow as a player--and he has shown growth--this is the type of player you can build on. He had 21 points--shooting 10 of 17 from the field, which is 58%. Coach said after the game that they challenge him to shoot 60%. If he can get that kind of percentage and shot volume in the post, he changes our offense. He has a really nice baby hook move using his body for space. He also had 8 rebounds. The second key was that BG's starters actually produced. All were in double figures. Denny was 16 on 6 of 10. Lillard had 16 on 5 of 7 and Ali had 16 on 6 of 9. Alcegaire scored 10 on 4 of 7. BG's freshmen were a little less productive, but Coach said they played hard with their minutes and he continues to be pleased with their progress. 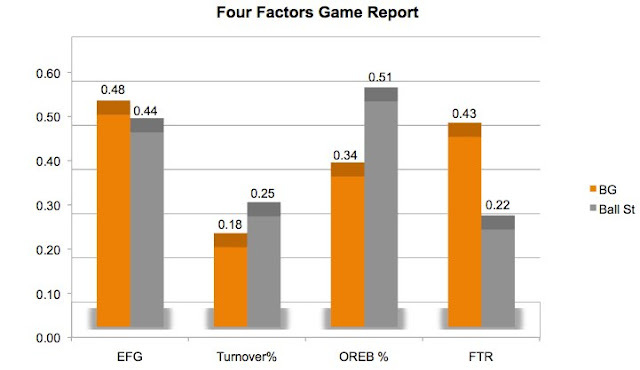 From a team standpoint, the game was played at 71 possessions, which favors BG slightly. Still, a lot of points were scored for a 71 possession game. 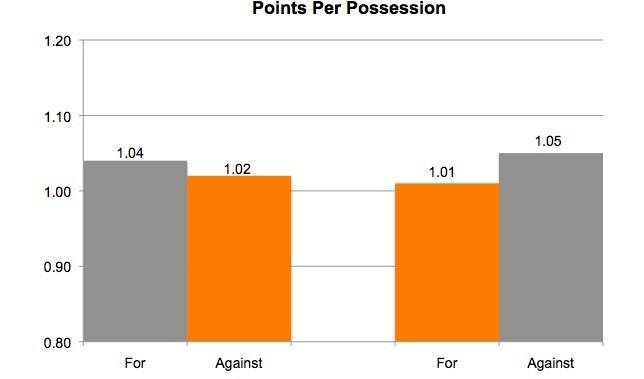 BG had 1.18 points per possession, their best offensive game of the year and it isn't really close. Now, the problem is that Akron scored 1.25 points per possession. BG only allowed more to UC. The Zips are a really good offensive team, though, and well-coached. Coach said BG had Johnson confused in the first half with double teams but the Zips adjusted better than BG and Johnson was able to pass the ball out of the post. Here are the numbers for the BG. With the exception of Norfolk State, this was BG's best shooting game of the year. BG shot 54% overall. They were weak on 3FGs, trying only 16 and making 4. So, if you aren't going to be great on the 3FG, then you need to be good at your 2FG. BG shot 64% from 2FG, which is the second-highest of the Huger era. Now Akron shot even better. That's the best any team has shot against us in the Huger era. They shot 57% overall and 45% from 3. 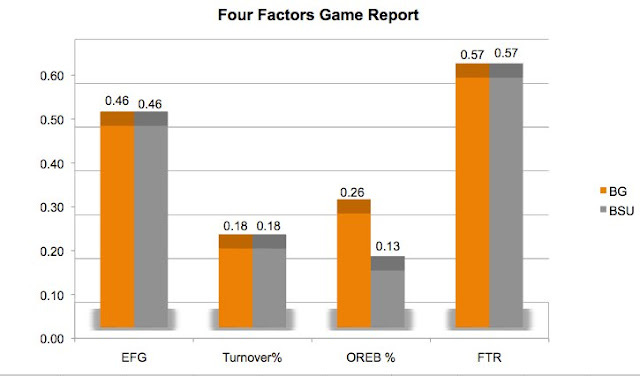 However, they did a poor job taking care of the ball, and those extra possessions kept BG in the game. As you can see, they had a big advantage on the boards and made 5 more FTs than BG did. (The Falcons did convert 14 of 17 at the line). So I guess if you want to look at this from the negative, BG had some issues playing defense. Still, Akron is really good on offense. Most of all, BG got a complete performance out of everyone on the floor, especially the starters. If some of those players can string games together--especially Lillard, Ali and Denny--then I think the Falcons are at least competitive. If Wiggins continues to grow, there are going to be open spaces on the floor. BG to the JAR. Historic Trail of Tears.